Great news released today by the Savannah Music Festival in a preview of next March’s 17-day event: the Bill T. Jones/Arnie Zane Dance Company will open the 2013 festival with Play and Play: an evening of movement and music. The news appeared in the SMF’s brand new quarterly newsletter News & Notes, which also includes the latest on board members and new president Harold Yellin, plus updates on a educational initiatives and the like. But it’s the inclusion of the Bill T. Jones / Arnie Zane Dance Company that grabbed my attention. Performed with live musicians, the Play and Play applies Jones’s inventive choreography to some of the most important Western musical works of our time. Featuring compositions by Beethoven, Mendelssohn, Mozart, Shostakovich or Schubert this program highlights the joy of musicians and dancers working together. Repertory includes D-Man in the Waters (1989), Bill T. Jones’s joyful tour de force and a genuine modern dance classic, as well as Spent Days Out Yonder (2001), a sublime reflection on the second movement of Mozart’s String Quartet No. 23 in F Major. The Bill T. Jones/Arnie Zane Dance Company was born out of an 11-year collaboration between Bill T. Jones and Arnie Zane (1948–1988). During this time, they redefined the duet form and foreshadowed issues of identity, form and social commentary that would change the face of American dance. The Company emerged onto the international scene in 1983 with the world premiere of Intuitive Momentum, which featured legendary drummer Max Roach, at the Brooklyn Academy of Music. Since then, the 9-member Company has performed worldwide in over 200 cities in 40 countries on every major continent. Today, the Company is recognized as one of the most innovative and powerful forces in the modern dance world. 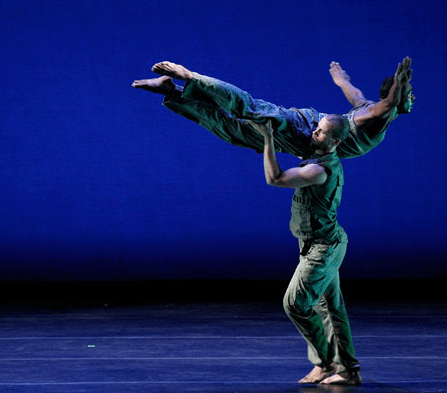 The 60-year old Jones is a towering figure of the dance world, with both a MacArthur “Genius” Award (1994) and Kennedy Center Honors (2010) among his credits. This is incredibly exciting that the SMF is making this foray into dance for 2013.